More than 1,000 facts, from strange (cats can be left-handed!) to astonishing (cats can be left-handed!). Did you know Herbert Hoover kept pet alligators? And that the longest recorded bout of hiccups is 68 years? If contemplating those bizarre circumstances left you craving more, add this book of trivia to your coffee table collection. It has more than 1,000 knowledge tidbits that range from the strange (cats can be left-handed!) to the astonishing (cats can be left-handed! ), so you'll never have to talk about the weather at a party again. Made in China. 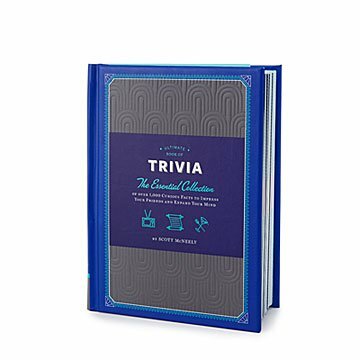 Excellent collection of trivia, well sorted and labled. My husband & I have Date Night every Friday .. and our usual restaurant has trivia cards on the tables ... but we are finding that alot of the subject matter is not based on our generation or knowledge. With this trivia book, we played the first time with my daugher & her husband & had a blast while learning interesting facts.